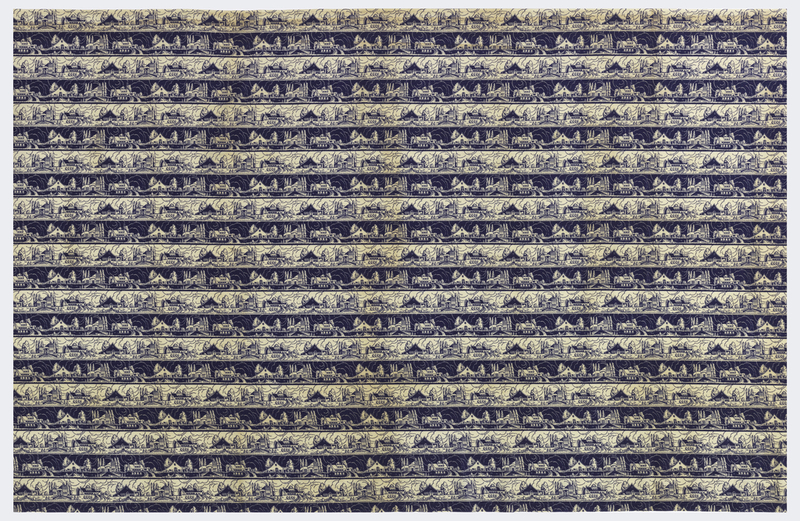 This charming cotton dress fabric was anonymously donated and remains anonymous itself, as there are no designer or manufacturer markings in the selvedges. It was probably intended for the home-sewing market, for which many so-called “conversational” prints were produced and made into women’s full, gathered shirts or men’s casual shirts. Although not categorized as a high-end fabric, the pattern is sophisticated and, together with 2005-32-2, would provide a witty commentary on the cultural scene in the United States in the postwar years. I am very curious about the level of interpretation here. Where is the evidence of “satire” beyond a present-day ironic worldview on the promises of high Modernism? What indicators provide the justification for the postwar dating? I’m no textiles expert, that’s for sure, but if this post had described a charming late-1930s fabric that artistically depicted and embraced the evolving (and very “current” for the time) domestic romance of the “suburban” (a term that would definitely come to have different meaning in the postwar era) streetscape, I would have found the story equally (and perhaps even more) believable. One missing feature of this post would be a close-up of the house renderings that helps us understand the relative style and appearance of the modern house vs the cottage and bungalow (as best I can tell – one has to dig deep on the item page to access a better view of the pattern, and it is not especially sharp. From what I can see, the more modern (Modernistic would have been the 1930s term) house is rendered with just as much charm, affection, and romance as the other two – why is this satire? A quick look at house plan books of the late 1930s shows homes just like this one throughout their pages, right alongside the generic Craftsman bungalows, English cottages and Colonial Revivals of the time. These Modernistic houses, while often viewed as extreme or weird in the period, still embraced a certain level of sentimentality and ornamentation (like this fabric, incidentally) that would soon be swept away by the rationality of the International Style and high Mid-Century Modern after the war. Something about the satirical interpretation and fabric dating in this post just leaves me wondering if there might be more to the story? I see the possibility of genuine affection here, rather than satire.